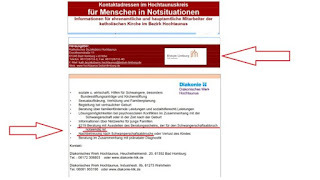 (Gießen) On the website of the diocese of Limburg under the heading "Pregnancy counseling" mothers are still encouraged to get a "counseling certificate," "which is necessary for terminating pregnancy" (page 26). This formulation is not intended to protect the life of the unborn child, but wants to encourage pregnant mothers to have their child murdered unlawfully, but without punishment. With the same offense today (24.11) a doctor has been sentenced by the district court of Giessen with a 6,000 euros fine. The doctor's lawyer wants to appeal this verdict. Pro-lifers suspect that with the abortion advertising on the Internet, there is an open support of those forces who want to achieve an elimination of §219a from the Penal Code. As we know, German bishops have problems with the morally theologically clear abortion ban. Even today, many pregnant women are sent by Catholic counseling centers to institutions that issue bills for punishment-free abortion and provide contacts. The lack of distancing and partly open support of the hostile organization "Donum Vitae" is another example that unborn life in German dioceses can be called into question despite contradictory explanations. On 20 November, the site of the German Bishops' Conference catholic.de published a commissioned article by the Limburg diocesan spokesman Stephan Schnelle, which he had previously announced with threats and insults against Katholisches.info. 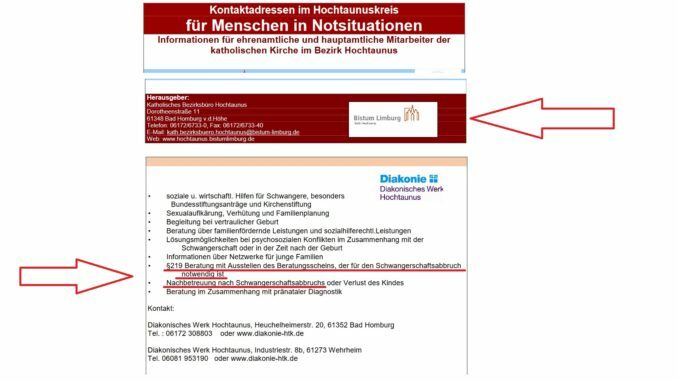 The article has "reported," the spokesman of Bishop Bätzing as saying, "they had removed the PDF file immediately from the website after it had been made aware it." That the other abortive advertising is still available, he concealed. Likewise, he made threats and insults to those who had "brought it to his attention." Incidentally, Bishop Bätzing has been alerted by several referrals, according to statements by various Pro-life activists. Only the reporting of Katholisches.info led to a partial cancellation of abortion advertising. The abortion advertising screenshot was created today at 5:30 pm on November 24th. The above-mentioned link leading to abortion advertising was also tested at the same time. Already on 19 November, this online magazine had reported on the still existing abortive advertising.